Two teams that were knocked out of the playoffs in the second round last year are one win away from the state championship game. The fourth-ranked Sabetha Blue Jays will travel to face the second-ranked Silver Lake Eagles, and the winner will face the winner of Marysville and Phillipsburg in next week’s Class 3A state championship game at Hutchinson Community College. Last year, Sabetha fell 34-28 in the second round to eventual state champion Rossville, and Silver Lake lost 21-14 to Nemaha Central. Sabetha’s only loss this season came 21-7 to Nemaha Central in Week 7. Since then, the Blue Jays are on a five-game winning streak and have outscored their opponents by a combined score of 267-39. Last week, Sabetha’s split-back veer offense rushed for more than 600 yards in a 56-13 win over Osage City. Joe Gruber led the way with 164 rushing yards. Gruber has rushed for 1,082 yards and 13 touchdowns on the season. Mason Engelken, Wyatt Beyer, Gabe Garber, and Joel Hackney have rushed for 887, 650, 558, and 572 yards, respectively. Sabetha is coached by Garrett Michael, who has a 56-41 record as a head coach. Silver Lake is undefeated, but the Eagles have had some close calls. Their wins over St. Marys, Perry-Lecompton, and Galena were by seven points or fewer. Last week, Silver Lake built a 13-0 lead and held on for a 13-6 win over Galena. Unlike the Blue Jays, the Eagles boast a balanced offense. Silver Lake rushes for 165.4 yards per game and passes for 163.7. Junior quarterback Mason Griffin has passed for 1,617 yards and 19 touchdowns with only two interceptions. Senior Mason Jones has rushed for 1,033 yards and 18 touchdowns. Senior Trent Byers has 47 receptions for 743 yards and eight touchdowns. The Eagles are directed by the winningest coach in state history in C.J. Hamilton, who boasts a 412-90 record. He entered the season as one of only 20 coaches in the nation to win 400 games. Multiple questions swirled around the Panthers, No. 1 in Class 3A, entering last Friday’s game at Hesston. In ’16, Hesston had an upset-filled run through the playoffs that included a road victory against the Panthers and eventually finished as state runner-up. This year, the Swathers upset Conway Springs in the second round, and then faced the Panthers. Phillipsburg junior quarterback Trey Sides, a three-year starter, is out with a thumb injury. However, his brother, freshman Ty, stepped in and helped the offense. 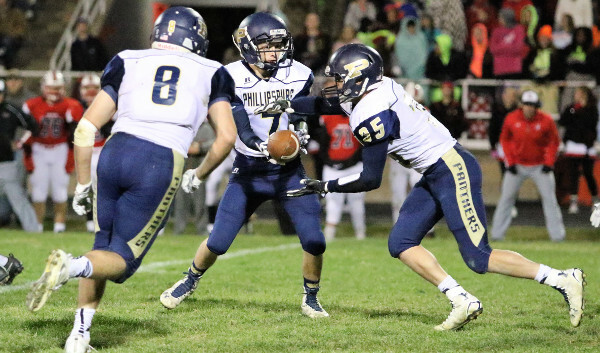 Phillipsburg rolled to a 47-7 victory with all of its points coming in the first three quarters. Phillipsburg has not permitted a first quarter point all fall with a total margin of 206-0. Ty Sides completed his only two attempts for 41 yards and a score. Treylan Gross had 13 carries for 146 yards and two scores, while Kirk Coomes had 16 carries for 117 yards and a score. John Gower tallied 16 carries for 115 yards and three TDs. Hesston had 193 rushing yards but 80 of those came on Parker Roth’s touchdown run late in fourth quarter when the game was out of reach. Phillipsburg moved to 12-0 and has set a school record for wins. The Panthers are in the middle of the best stretch in school history. Phillipsburg won the Class 2-1A title with a 10-2 mark two years ago before an 11-1 season last fall. The Panthers are second in 3A in scoring offense per game (52.1) and first in defense (8.8). Phillipsburg has experience all across the board, especially up front with its depth-laden lines. The lines feature plenty of size with sophomore Noah Vankooten (6-3, 250), junior Jaret Shelton (5-7, 220), senior Nate Tedford (6-2, 205) and senior Chris VanKooten (6-0, 190) among the key players. Coomes and Gross have each cleared 1,000 rushing yards. Phillipsburg has averaged more than 335 rushing yards a contest and more than 395 yards a game in total offense. The defense has been remarkable. The Panthers have held teams to 3.1 yards per carry and 92.8 rushing yards a game and just 3.4 yards per play. A win puts the Panthers in its second state title game in school annals. Marysville is looking for its third state showing after runner-up finishes in ’90 and ’09. The Bulldogs, which won the 3A basketball crown with many of the key football players, has turned the program around with fifth-year coach Dustin Heuer. Marysville had three straight 0-9 seasons before 4-6, 7-3 and now 11-1. The Bulldogs are one of the state’s top aerial attacks with 195 passing and 136 rushing yards a game. Senior Jack Blumer has completed 143 of 202 passes for 2,040 yards with a 25/2 TD/INT ratio. He leads the team with 690 rushing yards and is second with 12 rushing scores. Sophomore Atreyau Hornbeak has 95 carries for 555 yards with 13 rushing TDs. Senior Gabe Pieschl has 40 catches for 1,004 yards and 12 scores. The Bulldogs average 5.5 yards per rush but an outstanding 11.5 yards per pass. The Bulldogs have just five turnovers and stand at plus-13 in turnover margin. Marysville has some size, especially with veteran seniors Seth Mooradian (6-0, 240) and Bryson Meinhardt (6-3, 200). Marysville has a total margin of 552-224. The teams had multiple common opponents, including quality wins against Clay Center, Norton, Riley County and Larned, though the Panthers had a bigger margin in all four wins compared to Marysville. The Bulldogs, with a big experience edge at quarterback, will need to have a big game passing to win and likely must have points early. Ultimately this game will come down to the trenches. Phillipsburg’s line could be the difference.